I first wrote about How Does It Hurt? after returning from the launch in November. Then, it was pretty obvious the effect this book was going to have on me and I hadn’t read beyond the first chapter. I reviewed it in this week’s Nelson Mail. It’s difficult to know where to start talking about a book that has such profound meaning for me. 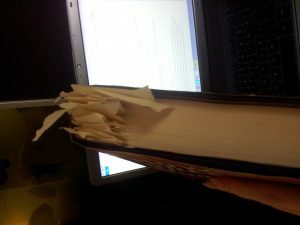 I knew there would be a lot that would resonate, and that I would want to share, so I marked pages as I went along. I copied all my favourite passages out and it’s… um… more than a few pages. Far more than I could fit in the column, and far more than is feasible to share here. I shall do my best to be as eloquent as Stephanie. De Montalk has deftly grappled with the subject of chronic pain from a personal, academic and poetic point of view. In the hands of a lesser writer it could have been a tedious disaster, but this is a beautifully written, fascinating and insightful work. – Recommended by Elspeth McLean in the Otago Daily Times. Why do I love this book so much? Tilly Lloyd from Unity Books says, it’s “not one of those introverted impenetrable pieces of academia. 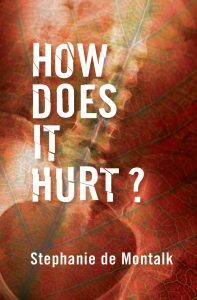 [It] probes why it is so hard to measure pain, why it resists accurate verbal description.” (RadioNZ review here). In an interview with Kathryn Ryan, Tilly points out that there hasn’t been anything much published that really looks at chronic pain. What we know is a pain dichotomy. There’s broken leg pain, and there’s terminal cancer pain. Both of these have their own distinct narrative. Chronic pain is a completely different story. Chronic pain is defied by both language and culture. “Our culture prefers any suffered of chronic pain to remain stoic,” says Tilly. When it comes to the experience of longterm pain, words are not only inadequate, they become meaningless. As Stephanie concludes in the book, it is only truly possible for chronic pain to be communicated between fellow sufferers. However, she tackles the subject with precision, compassion, eloquence, and infectious curiosity. As other reviewers have said, the mix of memoir, poetry, biography and medical science could have been chaotic, but Stephanie’s deft hand weaves stories that span centuries of pain experiences. As well as her own life, she explores that of Harriet Martineau (1802-187), a writer, feminist and social theorist who suffered from a massive tumour most of the latter half of her life; Aleksander Wat (1900 – 1967), a Polish poet, prisoner of war and political activist, and Alphonse Daudet (1840 – 1987), one of a group of famed syphilitic French novelists. 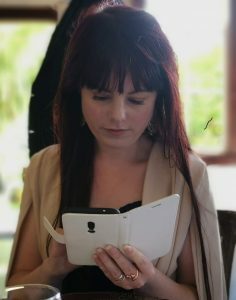 Daudet’s posthumous work In The Land of Pain was given to Stephanie at the beginning of her PhD by Damien Wilkins, and feels like it became integral to her work. The short book (which I am now reading) is a series of personal notes that Daudet intended to publish but never became sure in what form. They detail the life of someone in chronic pain with horrifying accuracy. I find the same intense honesty in Stephanie’s writing. Suicide is a subject that is closely linked to pain, and one that many shy away from – medical profession, sufferers, and carers alike. Stephanie has not. It is indeed a great challenge to find descriptors for the pain itself, but as she identifies, the emotional and mental implications of suffering reach far deeper. Ongoing pain with no relief in sight calls upon all human faculties of resilience and compassion. It is impossible to be continuously strong in the face of this pressure. The lives of Harriet, Aleksander, and Alphonse are fascinating and she has more than done their journeys justice. But it is the glimpses into the life of Stephanie that were able to provide the respite I needed. The following passages held a sharp edge of familiarity, the recognisable fear of saying these things out loud, driving those who care away and further isolating oneself. “I struggled in particular with the codes of ‘dignity in silence’ and ‘let’s pretend and the less said the better’. I rehearsed nuanced replies: Not too bad. Not so good. As good as. Waiting and hoping. In response to casual enquiries about my back, I joked, ‘It’s not my back that’s the problem—I’ve a rat trapped in my pelvis.’ In company, I was the odd one out, the one with an invisible, dismissible ailment. In my heart, I was pre-pain—at Wellington airport, en route to Warsaw, with a white Nike tick on my jacket. This was a difficult pain to explain. I could call up descriptors and metaphors, but they alluded to physical trauma and ignored the mental ordeal. Moreover, conditioning had taught me that they were not the sorts of words the world wanted to hear. And I worried about wearing out family and friends. As Arthur Kleinman made clear in The Illness Narratives (1988), relatives and friends ‘sit in the same waiting rooms’ and ‘travel through the same land of limbo, experiencing similar worry, hurt, uncertainty and loss’. On the one hand, I was warmed by the trustful understanding of those for whom the nature of the pain was not in doubt. This desire to express the pain experience perfectly, mixed with doubt and frustration, was an exact match to mine. The isolation that springs from that hesitation is a key part of the experience. The longer the pain goes on, the more impact it has on your identity. “Daudet described unremitting pain as ‘an infiltration’: as ‘[finding] its way everywhere, into my vision, my feelings, my sense of judgement’. Aleksander Wat spoke of its ‘mask of ugliness on everything, on all the beauties of the world’. Harriet Martineau knew it as ‘a thick heavy cloud of care’. ‘Pain has an uncanny power to throw us back on thinking styles absolutely basic to who we are,’ observed David B. Morris in his Foreword to Lous Heshusius’s Inside Chronic Pain. This is how it hurts. Not only is the academic writing deeply satisfying, the poetry is profound, the personal narrative far beyond moving, and the book as a whole a totally unique resource for sufferers, carers, and anyone in the medical profession. This entry was posted in About illness by writehanded. Bookmark the permalink.